All those reviews of Tom Hardy in Legend are right: he's terrific - twice. 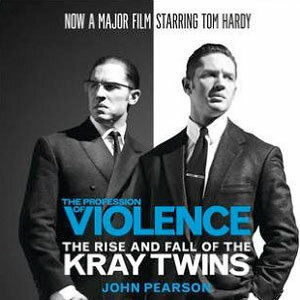 You completely forget that it's the same man playing both Kray twins, not just because the ‘in shot simultaneously' trickery is used sparingly (though when it is it's brilliant), but also because Hardy has put in two majestic performances, either of which would have stolen the show. So for two hours you watch a man trying to steal from himself. Given the subject matter, this is fitting. Inspired by my book Walk the Lines: the London Underground - Overground, each of these trivia-packed walks uncovers London’s history by following a section of a Tube line ... at street level. On a visit to Big Ben, I was told that if you stand at the bottom of the tower with a portable radio and listen to the chimes on Radio 4 (they still transmit them live), you hear them on the radio before you hear them ‘for real’. I couldn’t believe it – but was intrigued enough to try it for myself. And you know what? It’s absolutely true. The bongs come out of the radio a fraction of a second before they reach your ears from the top of the tower. It’s something so silly, so counter-intuitive, that you have to tell people. (Well, I did.) Researching the explanation, I found that it’s because radio waves travel at the speed of light (186,000 miles per second) rather than the 700 or so miles per hour at which sound waves travel. The signal travelling down the wire from the microphone to the BBC goes at the speed of light too. Hence the radio version overtaking the real one. I realised that this would be the perfect way to teach the principle in school physics lessons. Instead of a boring teacher droning on that ‘radio waves travel at the speed of light’, illustrate it with this beautiful and quirky little fact. The kids will remember it then. I certainly would have done if my physics teacher had taken this approach. As it was I had to wait until I heard a piece of so-called ‘trivia’ in my thirties. Copyright © 2009–2019 by The Importance of Being Trivial. All rights reserved.